Laura McNaney, left, compiled these letters. Her granddaughter Marilyn PARKE Scanlin sent them in for us to read. I do not have many records of my Mother’s family. My Grandmother Maycumber’s mother was Rebecca Thorn. 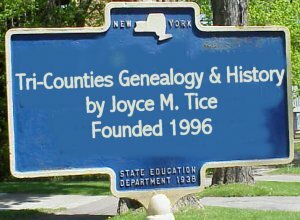 She was born in Schoharie Co., N.Y., March 16, 1799. Her maiden name was Adams. She married Benjamin Thorn. If you read the letter in the yellow envelope, you will have about all the history I have of great grandmother and great grandfather Thorn. I know they were Quakers and they lived up to their belief. I now seat myself to say to you Dear Mother is no more she departed this life May 4th half past four in the morning. She was taken sick early in April but got better so that she was about house again and then she was taken down again but got about house again until the morning of her death when so said to me, ‘I am very sick if I don’t get help immediately I shornt live two hours about half past four she breathed her last she was fully prepared for the hapy change her mouth and eyes closed just as though she was going into a sweat slumber. She gasped very opently three or four times not a sigh not a groan not a struggle not a hand nor foot moved dident even straighten her self in the bed went just as if she was going into sweet sleep she had been failing all winter she had frequent said to me she never shoud see the leaves past fourth again the evening before she died she said to me she as redy and willig to die any minit and wanted to go and be at rest when we saw she was going and must give her up H.M. earnestly prayed to her heavenly Father to come and go with her and give her an easy passage it seem as the that prayer was anserend in an instant. Such a sweet countinence such bright ray of heavenly light rested on her countinence. I never saw the like that smile was on her countinence. Still when she went down into her grave it was remarked by many that she was the Sweetest neatest pretyest corps they ever saw for an old lady her age was 77 years one month and 14 days. I’se many lonely sorrorwfil hours my loss is very great. We deeply mourn the loss of her company but we feel that our loss is her eternal gain. We had lived together fifty eight years and six days. If this reaches you in safety pleas answer immediately. We want to hear from you and should much like to have you come and make us a visit. I remain as ever, your well wishing father. David and Elizabeth, your kind and very welcome letter came to hand in good time but but I have been detained from answering in countinence of sickness and death in the family. Hannah Marie was sick all winter but kept about house until short six weeks before her death which occurred the seventh of March evening. Her sickness she was a great sufferer. She was perfectly resigned to the will of her heavenly father a few weeks before her death. She said to me, I am going to meet my Dear Mother very soon I know I’am you and Charlie are all that stands betwinst me and heaven. I should like to liv to take care of you that’s all I want to live for a few days. Before her death she said I leave you all in the hands of the Lord. I am willing to die. The morning she died she said O if the Lord would take me now away from this suffering. A few minutes after she said "what a privilege what a privilege. I think that was her last words. Funeral services by Elder Brown and professor Liben of Quaker Street discours deep and interesting. A large congregation in attendance. Levi and H. M. wane good and kind to me in consiquence of her death. I lost my good home to Maryland. Leanden and Aron offered me a home here which is most greatly accepted and a good home I have to I have every thing heart could desire. The greatest kindness bestowed upon me. I left many kinds friends to Maryland I was loath to part with them. They advised me to come here being well assured I would find a good home here. They kindly provided a way for to get here. I had to part with dear little motherless Charlie after living with him seven years. Levi accompanied me down here. We left Maryland on Saturday March 29 on the eleven o’clock express come down to Otege staid there over Sunday. Left Monday morning April first for Addison. Arrived at Addison about six in the evening. Found Leander and Ann waiting there for us. I like it rite well here. Think its real pleasant here am perfectly contented here. I haven’t been home sick in the least. Ann real bad on with something simeller to her old complaint. She has become a large fleshy womin. Her flesh not good. She is lame and sore all over. Doctor says she can fetch her out of it again. I hope I can. She keeps up good curage, she thinks she shall be all right again soon. We should happy to have a visit from you once more. I am now past my four score years and enjoy good health yet Ann joins I much love to all with many good wishes for your present and future welfare. The lock of hair in the envelope was a lock of great-grandmother’s that great-grandfather Thorn sent to his daughter Elizabeth. (My grandmother Maycumber). The sample of cloth I think must have been a piece of great-grandma’s shroud. In those days close members of the family always saved a lock of hair and a piece of the shroud of the departed. Many times these mementoes were mounted and framed. Aunt Ann (grandma Maycumber sister) had mounted and framed several locks of hair of the different members of her family, also pressed flowers. Benjamin Thorn was also born in Schorie Co., NY. He was born Jan 23, 1798. He died Dec 10, 1883, at the age of 85 years, ten months, seventeen days. That was the old way of writing. Grandmother Maycumber was born Elizabeth Thorn. 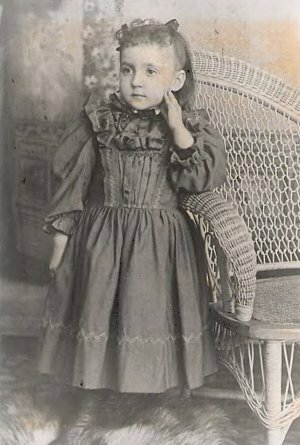 She was born in Jefferson Co., N.Y. on Sept 5, 1824. I can remember her well. She was such a sweet little lady. She and grandpa lived with us several years before she died. She always spoke as the Quakers spoke. 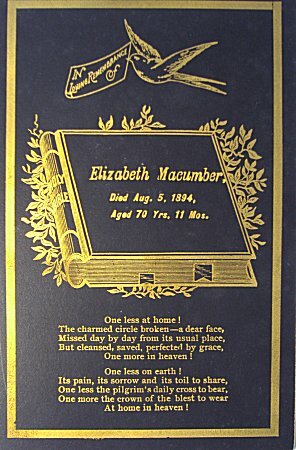 After she and Grandpa (David Maycumber) were married, they lived around and near Elmira. At one time they lived in the Button Woods, also in Christian Hollow. 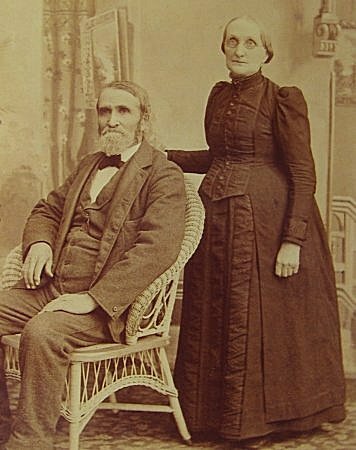 After my father and mother were married, Grandpa and Grandma moved "West", where some of their children had already gone – (Alaska and Issac, two sons.) However, in May 1891 they came back from Maquokita, Iowa to live with us. They lived with us until grandma died Aug 5, 1894. In the envelope here are the post card from grandpa saying when they would start for Elmira. The receipt for the registered letter containing money and tickets my father sent them for their trip here, are also here. Ed must have sent the letter for father. "These are the two letters received just before Grandma and Grandpa came to live with us." After so long, alive, I will try and answer your kind and most welcome letter which we receive and was very glad to hear from you but very sorry to hear that little Laura was not well. We hope she is well by this time, tell her that I would like to see her and that I send her five kisses. We are all about as well as usual. Mother is about the same. I am looking for the Dr. here every minute to see her now. Yes, Mary H. if Mother shoud get so she couldn’t write, I would write for her ay time. So, don’t worry about her for we do all we can for her. And if she shold get very bad, I would write and let you know right away. Yes, Mary we would like to come and make you all a visit this summer and bring father and Mother with us there is nothing that would please us better than to come if we could, but we can’t come this year and it looks as thought it would be a long time before we could. Alaska’s folks was all as well as common the last we hurd from them. I know little of Grandpa Maycumber’s family. From the few records I have, I gather that his father was Nathanal Maycumber, born April 30, 1793 in Cambridge, NY. He fought in the war of 1812. He married Ann Mackfield as near as I can find. She was born Feb 12, 1790. Died Feb 12, 1849 so says the records. Ann’s father I think was Barney Mackfield born in Glasgow, Scotland. Grandpa Maycumber had the following brothers and sisters: Subrina. Elizabeth, Nancy Ann, Patience, Barney and Benedict. One of Grandpa’s sisters married a missionary or doctor. They went to a leper colony and of course could never come back to their people. That was how it was in the early days there was not much that could be done for leprosy. When a person went to one of these colonies they knew it was for life. I can just remember "Aunt Pay" as Patience was called. She never married. She lived with Uncle "Vessie" (Sylvester) and Aunt Mary. She died of dropsy when I was about three years old. Grandma is buried in Woodlawn Cemetery, Elmira, NY. Grandpa is buried in the Pettigrove Cemetery, near Canton. Attached are notes and pictures from my grandmother's diary and collection. It covers Thorne and Maycumber family as she knew them. I've tried to faithfully type them as they were written. These have been transcribed from the original letters and notes of her family.